Opening our curtains we were greeted with clear blue skies for our first full day in Busan. Leaving our room for breakfast it seemed strange taking the lift upwards as the hotel’s restaurant is on the top (13th) floor alongside the reception area. Stepping inside, the breakfast area was very attractive with large, sliding glass doors leading out onto the rooftop garden. We found a table by the window and started the day with yogurt, fresh fruit and cereal before moving on to investigate the hot dishes. Here we found everything from western style bacon and fried eggs to hearty chicken, fish and rice dishes. 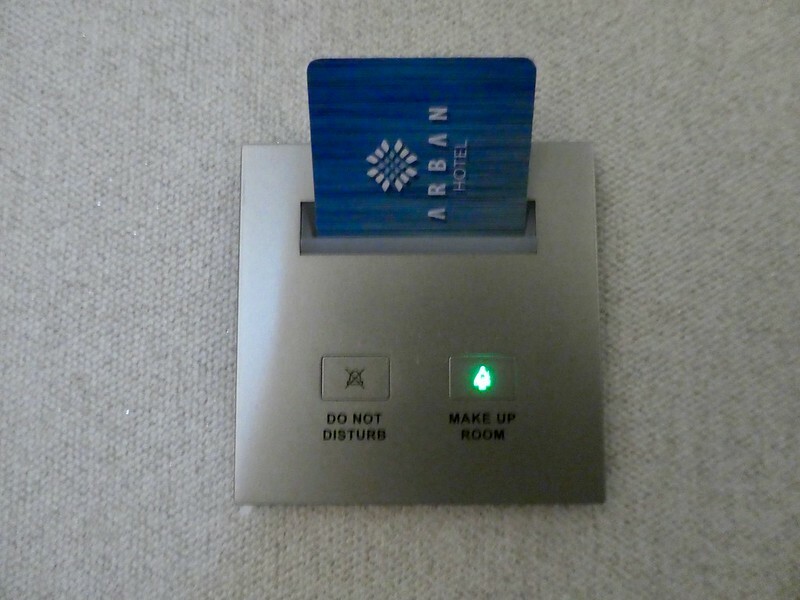 Returning to our room and ready to go out, we pressed the button near the light switch indicating that we wished our room to be cleaned. We came across a similar device in Taipei last year but haven’t seen one elsewhere, it’s a big improvement though from hanging a piece of cardboard on the door handle. 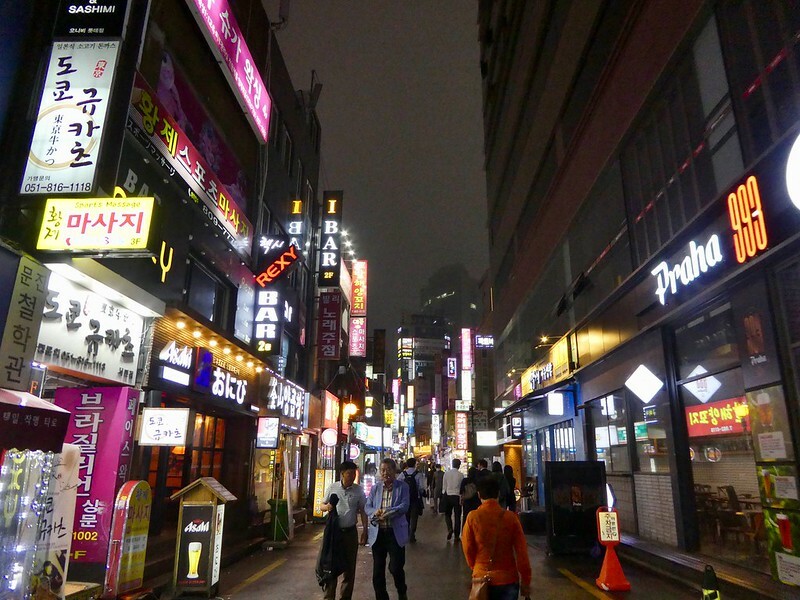 It was just a few minutes walk to the nearest metro station in Seomyeon. One reason that we had selected this district was that Seomyeon is an interchange station making it convenient to get around. We took the train to Haeundae Beach station, Line 2, Exits 3 or 5 which was approximately ten minutes walk from the beach. Haeundae Beach, located in the eastern part of the city, is the most famous beach in South Korea and is popular for family holidays during the summer months. Although it was quite warm for early May, it wasn’t sunbathing weather just yet. We wondered why parts of the beach were cordoned off and diggers were creating large heaps of sand. After reading some signs we discovered the annual Busan Sand Festival would be taking place the following week with giant sand sculptures and beach activities. We followed a path alongside the beach in a westerly direction towards Dongbaekseom Island where we crossed a wooden footbridge and continued along a walkway. 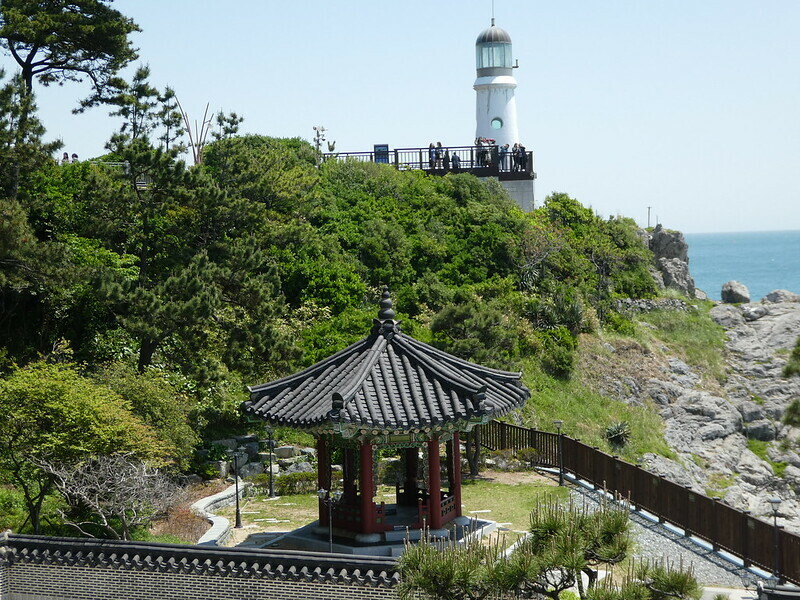 The island is very small and is named after the dongbaek trees that grow there. It was once separated by the sea but years of sediment have built up connecting it to the mainland. Just below the cliff we spotted a statue of a mermaid mounted on a rock. 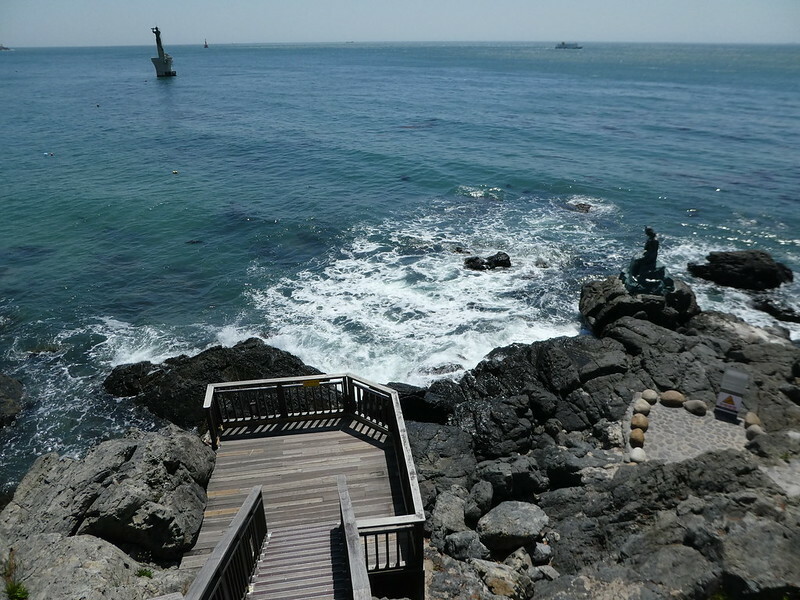 The statue symbolises the legend of Princess Hwangeok and depicts the story of the mermaid princess who misses her prince and spends her days gazing out to sea, longing for him to return. 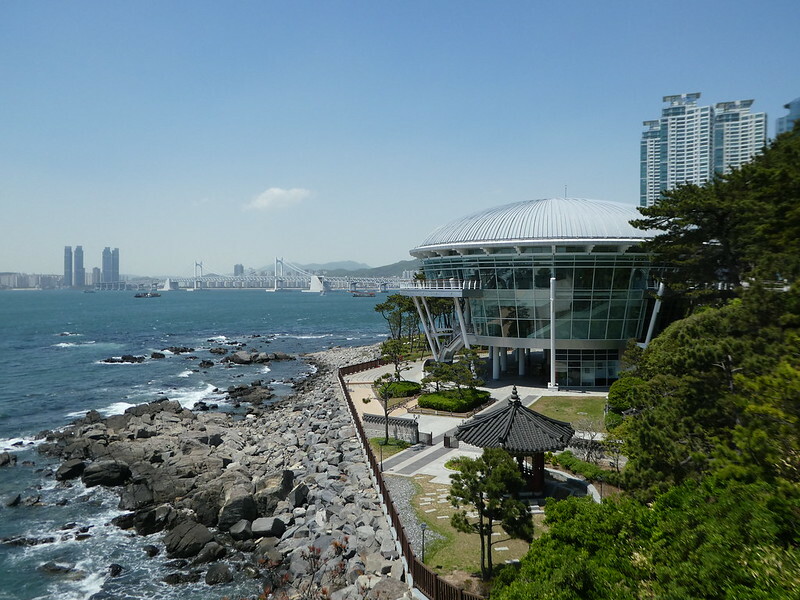 Continuing, we passed a lighthouse viewpoint from where we had spectacular views of the Busan coastline, the Gwangan bridge and APEC House, which was to be our next place to visit. 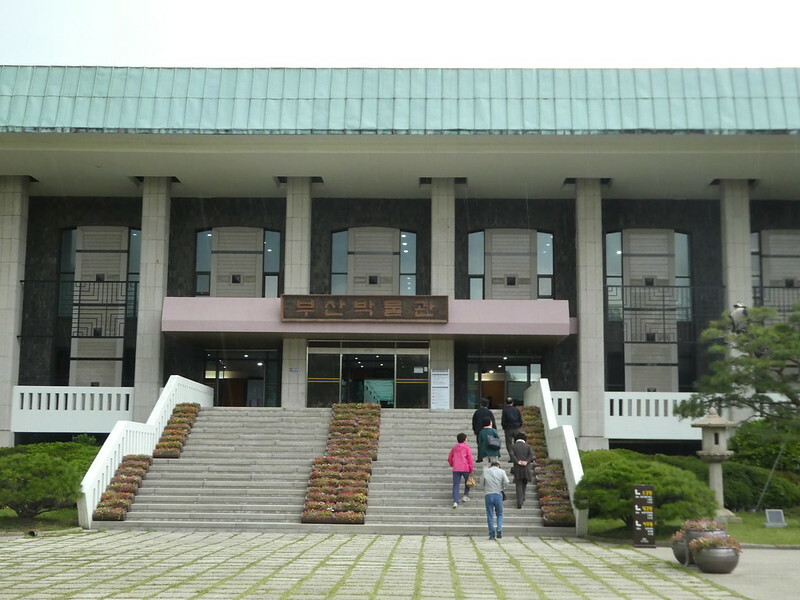 Built on a peninsula and surrounded by pine trees and camellias, stands Narimaru APEC House (Asia-Pacific Economic Co-operation) which is now used as a memorial hall and conference centre. It’s open to the public with free admission and our self guided tour included the meeting room set out as it would have been for the 2005 APEC summit together with its lounge and rooftop terrace. We’re always attracted to yachts and decided to continue to the marina but this proved disappointing as we found it wasn’t possible to walk along the quay and we were unable to see very much. Instead, we took the metro from Dongbaek station to Kyungsung University and Pukyong National University station then found a cafe on the edge of the Pukyong campus for some lunch. After strolling a short distance we reached Busan Arboretum which is free to visit and its attractive gardens contain 600 varieties of plants. 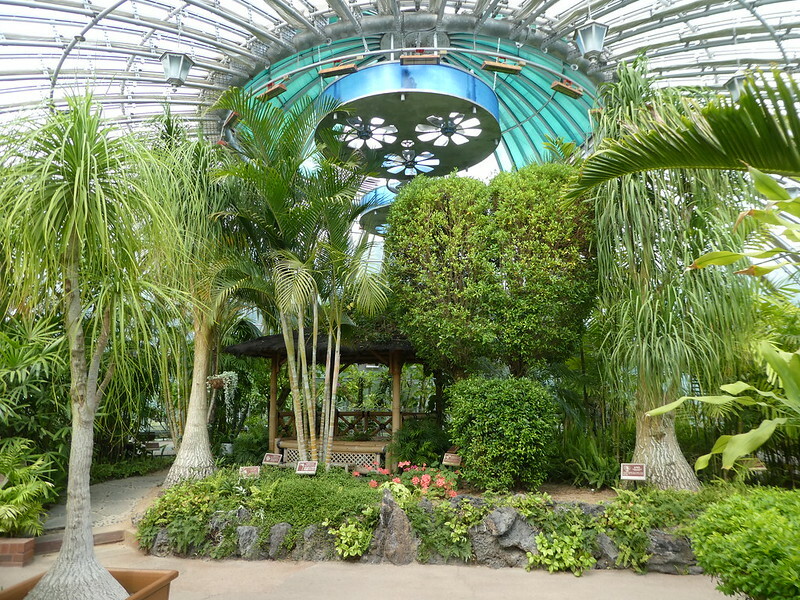 Exploring its glass house we found a selection of tropical and desert plants all clearly labelled. 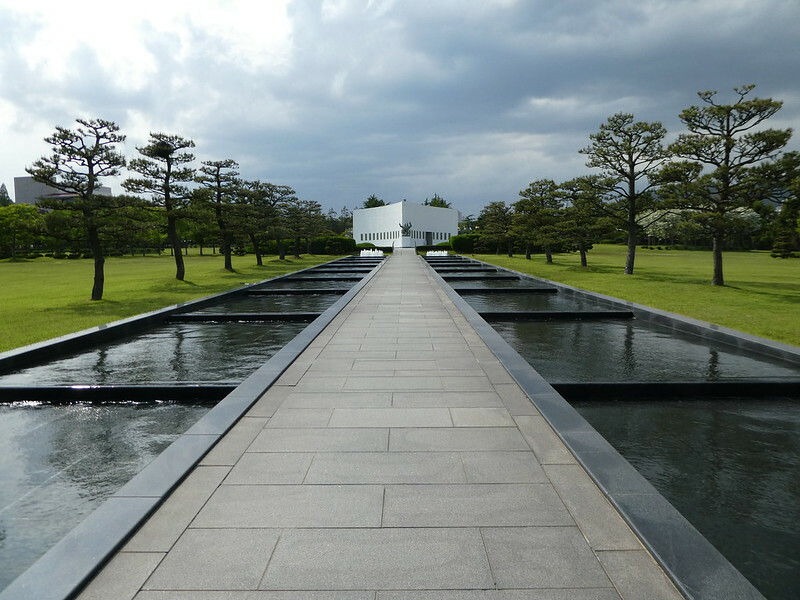 Beyond the arboretum lies the vast U.N. Memorial Cemetery in Korea which includes the cemetery, memorial hall, peace park and sculpture park. 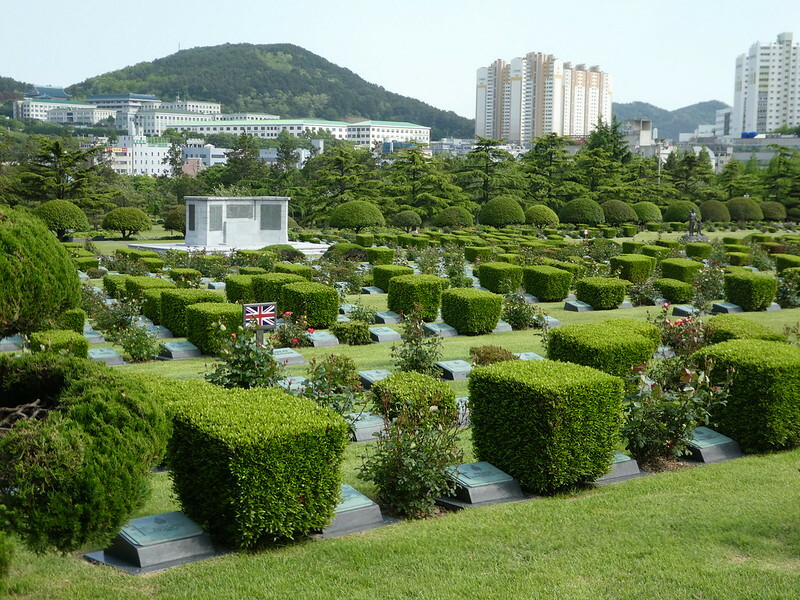 Opened in 1951, the cemetery was established to honour the service and sacrifice of U.N. soldiers who died during the Korean War 1950-1953 and is the only U.N. cemetery in the world. There are 2,300 graves on the 35 acre site, the majority of which are of British, Turkish and Canadian soldiers. The USA, who had the highest number of casualties in the war took all their fallen home soon afterwards. However, 36 members of the U.N. dispatched from the USA and stationed in Korea after the war who died wished to be interred here. The graves are set out in 22 sections designated by the nationalities of the buried service members. An Honour Guard from the Republic of Korea 53rd Division carries out a flag ceremony daily but our visit wasn’t timed to witness this. 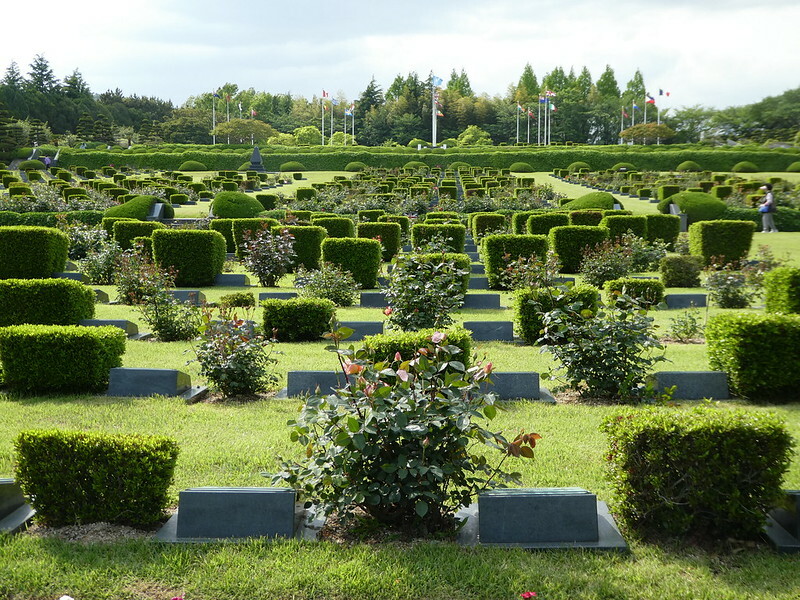 The cemetery is beautifully kept with sculptured trees, manicured lawns and a koi carp pond stretches the length of the main cemetery, edged with rose bushes and azaleas. 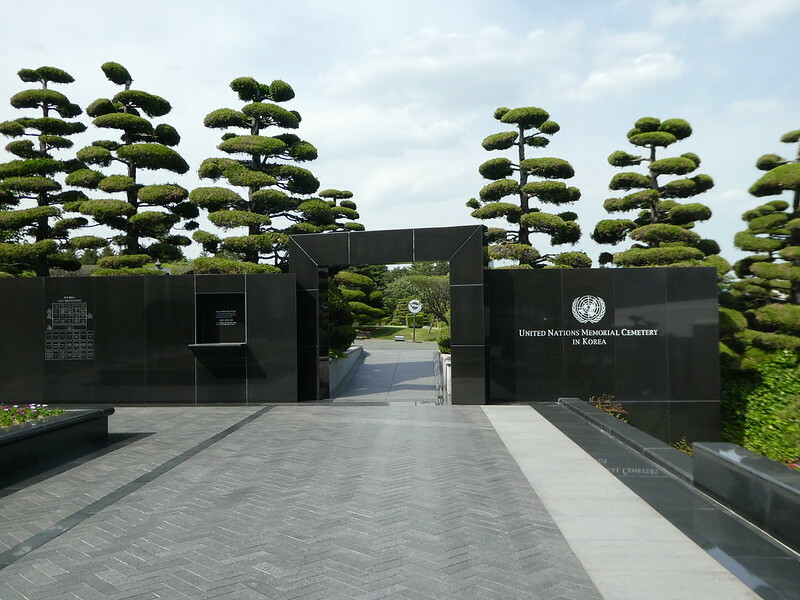 On the edge of the cemetery stands The Wall of Remembrance which was completed in 2006 and has the names of 40,896 U.N. casualties (killed and missing) inscribed on 149 black marble panels. We saw so very many names and when we had walked to the end of the curved wall we found the list also continued on the rear panels. It was a sobering and moving experience even for those of us who hadn’t suffered fatalities. Inside the memorial hall a video presentation takes place which is available in several languages. 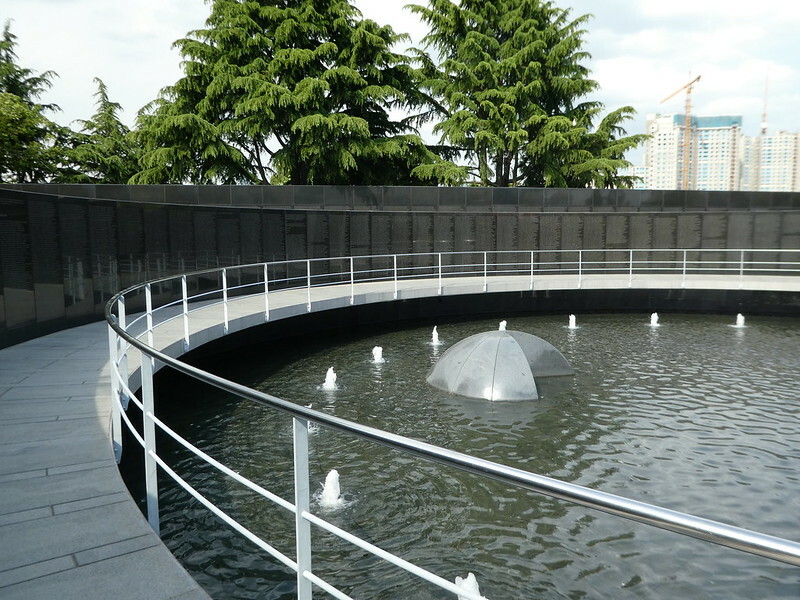 The U.N. Sculpture Park is near the exit and since it opened in 2001, 29 pieces have been created and donated by artists from a number of U.N. countries. A short stroll from the cemetery took us to our final location of the day, the Busan Museum. Admission is free and inside this large museum were excavated relics found in the Busan area from prehistoric age to modern times. The galleries revealed the city’s historical and cultural heritage and in the outdoor exhibition hall we found a collection of precious pagodas, Buddhist statues and monuments. There is a cultural centre in the basement which offers visitors an opportunity to experience a traditional tea making ceremony but this was unfortunately unavailable when we enquired. On our way to Daejeon metro station it started raining heavily so we popped into a bakery for some delicious green tea and cream cheese dough buns to keep us going before returning to the hotel. Thank you for your kind words. It’s so nice to read that you are finding my South Korean posts useful. A beautiful place and I enjoyed the serenity of the cemeteries. Happy travels! It really is beautiful at Haeundae. Thank you for your much appreciated comments. Everything orderly and beautiful, that’s Korea. Glad you got to see some of the country as you travelled from Seoul too. Now you need to see it in winter time but bring thick coats if you do. Thank you for your much appreciated thoughts Ian. We were so pleased that we decided to travel south to Busan and agree everything works so efficiently in Korea and is beautiful, too! Thank you Aaron for taking an interest in my post on Busan. I’m sure you would enjoy a visit. My son lives in Haeundae. He works about twenty minutes from there, but loves living in the large beach setting. What a lovely place to live with that beautiful beach on the doorstep. Thank you so much for your welcome thoughts. Really special. Thanks for the details about the cemetery. It’s so nice to read your comments on this post and to learn that you enjoyed that walk too. We considered going to that temple but didn’t go there. Something new to do if we return. Thank you for taking an interest n this post Jo. Busan is South Korea’s second city and we chose to visit there as we wished to experience a different part of the country. Getting around anywhere in Korea is easy with its high speed rail network and Busan is probably as far away from Seoul as it’s possible to travel. On one side of Haeundae Beach there are some high rise buildings but elsewhere it is unspoilt and natural. Thanks, Marion. As you can tell, I’ve never looked at the country in any detail. I know only of its sad history. What a fascinating city! The water is beautiful! Thank you for your kind words. Busan is a lovely city to visit and the sea does looks tropical ! Loving the post on a city that I knew nothing about. The U N cemetery looks fascinating . My brother in law fought in Korea and my brother was in the service but didn’t go because by thst time, the war had ended. Thank you once again for your kind words about my Busan posts. It’s interesting to read about your brother-in-law’s involvement in the Korean War. The cemetery was beautiful but so sad. He’s dead now but when I visit the Korean War Memorial in DC, I think about soldiers who were not as fortunate . I just began following your blog part way through your series on South Korea. I’ve been amazed by all your neat pictures and how many attractions there seem to be free. Did you look for free places to visit in advance or does that just seem to be commonplace there? Other than the Smithsonian in Washington DC I feel like every city I’ve visited I’ve had to pay to enter museums. Hi Tracy, It’s so nice to hear from you and thank you for taking an interest in my series of South Korean posts. 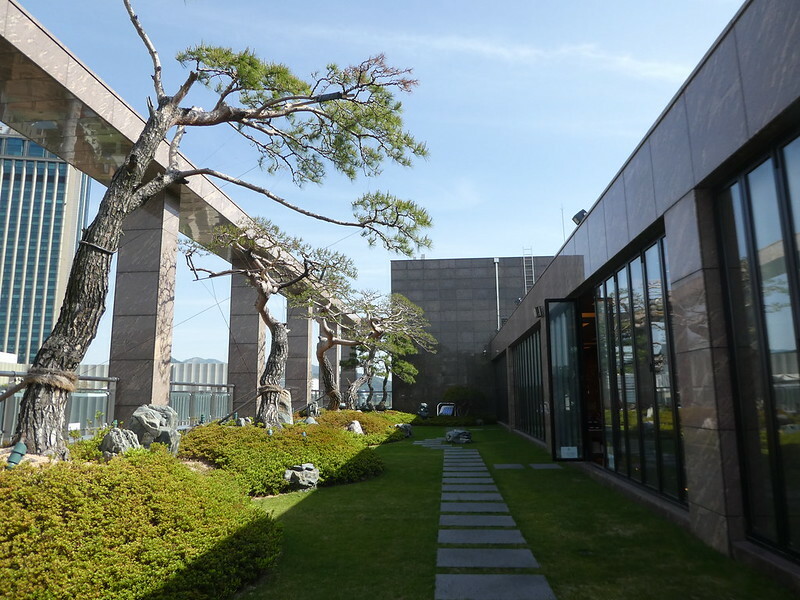 All of the museums and attractions in South Korea are either free or charge a minimal entrance fee which is great. Everywhere is well maintained with beautiful gardens and flowers and looks lovely. I hope my posts might inspire you to visit Korea one day. Great photos but too much city for me. I would rather be in the outback, but that is just me. Thank you for your much appreciated thoughts on my Korean posts and for liking my photos. Hi Joy, it’s so nice to hear from you again and to learn that you have been visiting the U.K. I’ll look forward to reading about your jaunts. South Korea has been beautiful and Busan in the south east has a lovely coastline. Looks very beautiful. Thank you for shedding light on a place I’d never have thought to visit. Thank you for your much appreciated thoughts on my series of posts on South Korea. Busan is a beautiful place to visit in the south east of the country and I hope my posts might inspire you to go there one day. Thank you, I’m glad you enjoyed this post on Busan. Love the way to let housekeeping know to make up the room. The door hangers always fall off. Exactly! That’s what often happens to me. I expect that these housekeeping devices will become commonplace eventually. Thank you for your comments, they are much appreciated. lovely place! !could u please help me to get more followers?Any tips?? Thank you! 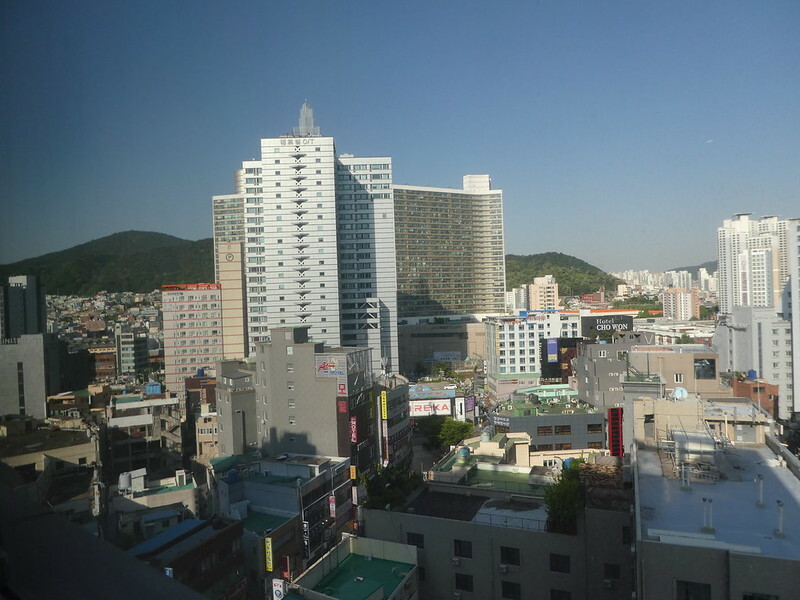 It’s nice to read that you have enjoyed this post on Busan. It takes time to build up a readership so I suggest just concentrating on writing some quality posts and overtime followers should come. Good Luck and enjoy blogging, it’s fun! The glass house is my favorite. It is so strange because looking at the beach itself, it could rival any beach in Hawaii. The beach looks very serene, but then you see the giant skyscrapers in the background. I like the contrast. It’s so nice to read your interesting thoughts on this post. 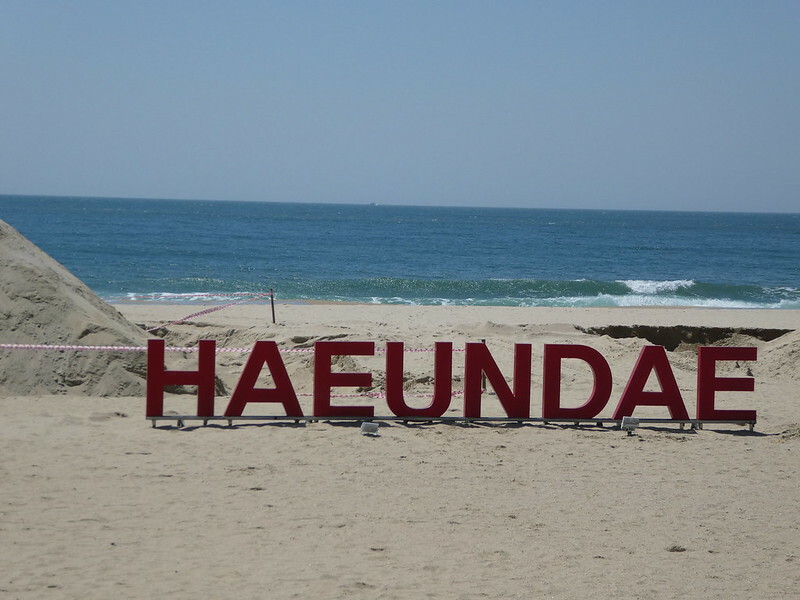 I also thought that Haeundae had a tropical feel to it! Thank you Freja for your kind words. I do hope you get an opportunity to visit Haeundae with your husband sometime soon! Great post, interestingly your posts takes us through your journey and I don’t feel that I am reading them! I have been to Busan some two decades ago and I don’t remember anything now! It’s so nice to read that you visited Busan about 20 years ago. I think a lot of building has taken place since then making it appear different but the coastline remains beautiful. It’s so nice to read your comments and to find that you have also visited Haeundae Beach. Perhaps next time you go there, you can walk along and take in those beautiful views. Yes, I definitely will! And probably also visit the places you’ve written about! Thank you! Amazingly good photos and I still can’t get over how clean everywhere is. The wall of remembrance and the cemetery look really impressive. And the coastline looks great. We had a splendid day touring these parts of Busan Jonno. It was all so interesting and very scenic. Thanks again for your much appreciated comments. Love the way you share your experiences. A learning curve for me … more pictures, less words 🙂 … thank you. Thank you for making contact Cecily. It’s so nice to read that you are enjoying reading my posts. Thank you! It’s nice to read you liked this post! Lovely place with so much to see and do. I have seen those switches in hotel rooms regularly now Marion; in my room in Seminyak in Bali just last month and yes much better than hanging something on the door handle. 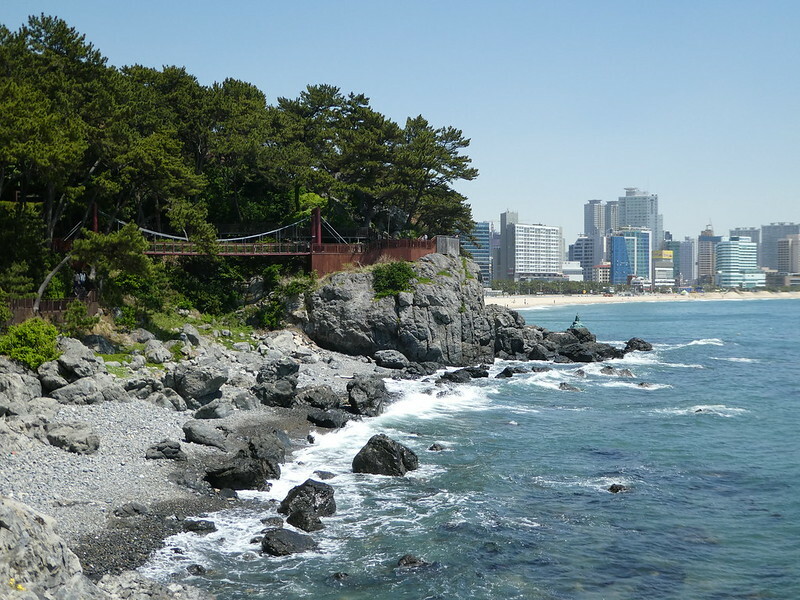 Thank you Sue for taking an interest in this post on Busan, the coastline is really beautiful there. It’s interesting to read that you have seen those room preparation switches frequently now Sue, I’m certain they will become widespread in Europe over time. Looking forward to hearing about your visit to Bali! 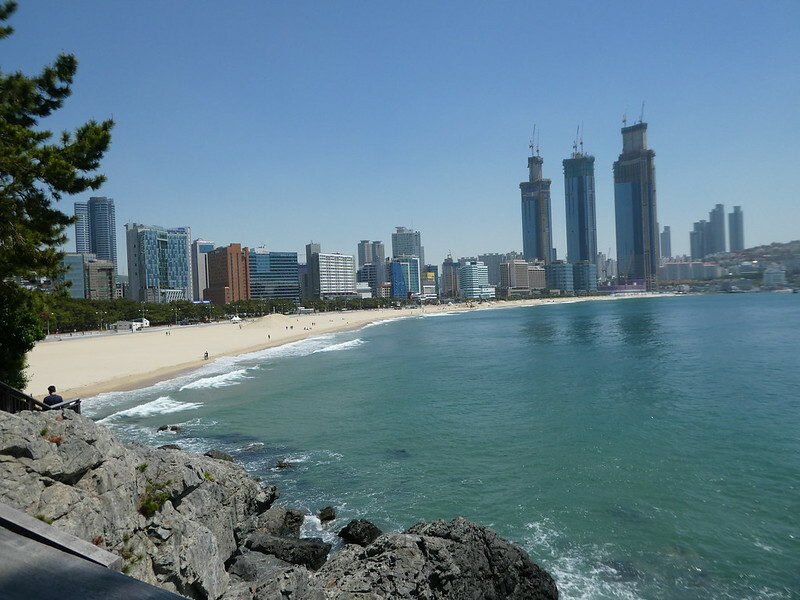 Haeundae Beach and along the coast is absolutely beautiful. I do hope you get an opportunity to visit Busan one day.